Katherine Sims joined the Baylor Law staff in September 2016 as the Director of Admissions and Financial Aid. She earned her B.A. in Speech Communication from Baylor University in 2006 and J.D. from Baylor Law in 2011. 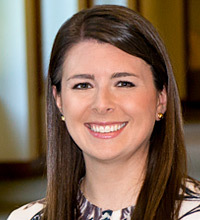 Katherine worked as a Project Attorney at King & Spalding, LLP in Atlanta, GA before joining the admissions staff at a law school in Atlanta in 2012. She has happily worked in law school admissions ever since and is proud to now represent her beloved alma mater. Katherine enjoys getting to know prospective students and helping them navigate the law school application process. She also loves sharing her passion for Baylor and Waco with them. Katherine is married to Tyler, an attorney, whom she met while studying abroad in law school. They have a dog, Walker, and a cat, Hamilton. When not recruiting the best and brightest future attorneys, Katherine enjoys running the Bear Trail, dining at one of her favorite local restaurants (especially Baris), and watching Baylor sports.